Here are a few select Toyota projects. How do you show an SUV as agile and fuel efficient? 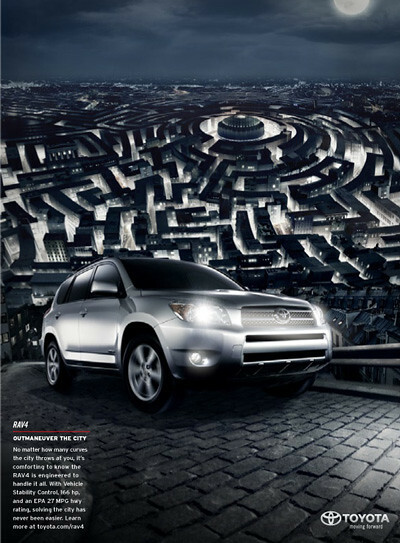 Partnering with Shilo, this banner ad and print piece follow up the TV campaign, set in the dark, moonlit world of the RAV4. This tandem banner “Fuel Duel” is a nod to the movie by a similar name. It depicts the 27-MPG RAV4 in a high-speed chase with a rusty, ominous gas truck, using a creative media buy to make the user feel they’re in the driver’s seat. Labyrinth had a wide circulation, running in over 14 magazines including Rolling Stone and People. One of the major challenges was making sure there were no inadvertent subliminal messages in the maze pattern. A “loading” bar turns into a payload which is then towed, hauled, or hoisted by the mighty Toyota Tundra. This 4×4 is not the soccer mom’s alternative to a minivan, it’s the social outdoorsman’s ticket out of town. The 4Runner is ready to take on any road to anywhere. So where should you go? Let the Adventure Finder decide. 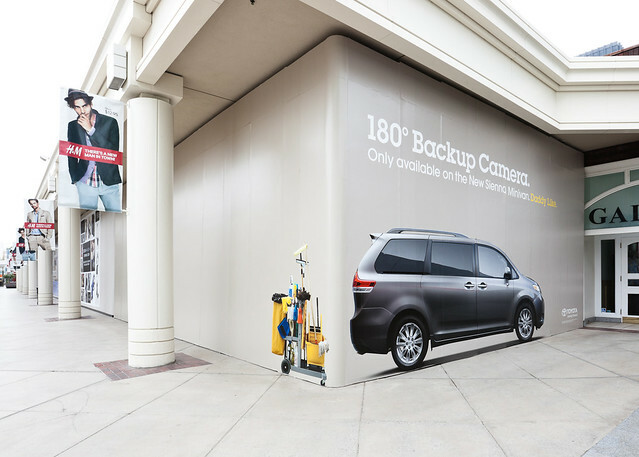 Installations like this one were featured in public places across America and touted the Sienna’s 180-degree backup camera. Credit goes to: Lindsey Montague, Elizabeth Alexander, Chelsea DuBois, Scott Huebscher, Bob Fremgen, Abe Cortes, Josh Stark, Alex Flint, Ron Thompson, Erich Funke, John Kritch, various others.